2 Is hacking My Story: Choose your own path possible? 2.2 Did the My Story Hack give us the tickets and diamonds? 2.3 Did any of the other diamond and ticket hacks work? My Story: Choose Your Own Path is a game for Android and iPhone released in 2017 by NanoBit. It’s a game that’s quite comparable to Chapters: Interactive Stories and Choices: Stories You Play. The game is quite popular on both Android and iOS. But many people believe that the game requires way too many diamonds and Tickets. And these diamonds aren’t cheap. The most expensive package costs $40. For that reason, there are thousands of people that look for My Story: Choose your own Path Cheats. We completely understand that and have actually been in the same situation. For that reason, we’re going to cover My Story Cheats in today’s post. If you have been looking for a way to hack My Story for a while then you know how many sites are out there that claim they can give you unlimited diamonds and tickets. But how do you find out which ones work and which ones don’t? That’s where we come in. We’re going to test all the hacks and reveal the truth about hacking in My Story: Choose your own path. Is hacking My Story: Choose your own path possible? In order to find out if hacking is possible in My Story: Choose your own path we started out by making a list of every hack site that we could find. There are literally dozens of websites out there that offer unlimited ticket and diamond generators, so testing them all out was going to be quite the challenge. However, since it’s the only way to find the truth, we had no other choice. In order to keep this post brief, we’ll show you our testing process once. Later on we’ll discuss the results of all the other hacks that we’ve tested. The image you can see above is a screenshot that we took of the My Story Cheats that we’re going to be demonstrating our testing on. That way you can see exactly what happens when you use a My Story Hack. As you can see in the image, the first thing we had to was enter our username. Afterwards we could insert the amount of diamonds and tickets that we wanted to generate. So that’s what we did in order to test this hack. 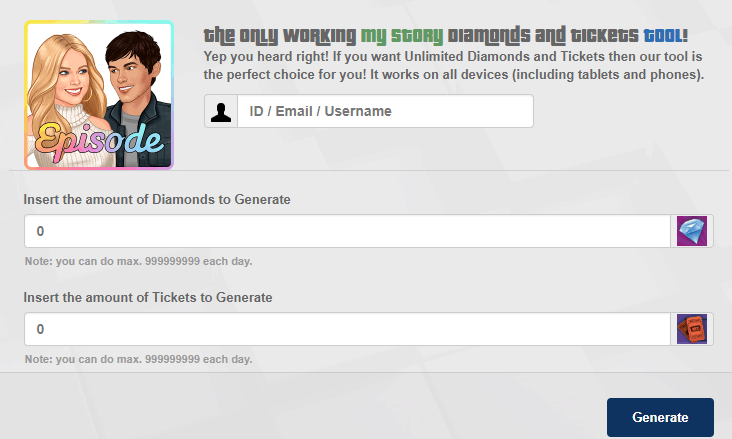 We entered our username and told the hack that we wanted to generate 1000 tickets and 1000 diamonds. Then we pressed the generate button. When we did this, a black window showed up informing us that the generator was working on processing our request. However, once the generator completed our request we were not done yet. In order to receive our tickets and diamonds we apparently had to verify that we are a human. This was quite frustrating, because we had to complete a survey to do so. But did we receive our tickets and diamonds afterwards? Did the My Story Hack give us the tickets and diamonds? Unfortunately, after we completed the human verification and booted up My Story: Choose Your Own Path we noticed that our tickets and diamonds had not increased at all. 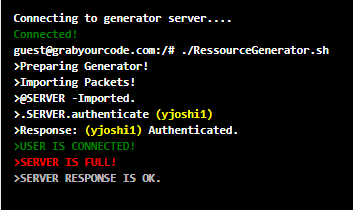 This was weird because the generator promised that we would receive the requested resources immediately after completing the verification. So we waited a couple of hours and checked the game again, but we still hadn’t received anything at all! It turns out that this hack for My Story: Choose Your Own Path was completely fake and a huge waste of time. Did any of the other diamond and ticket hacks work? All of the hacks for My Story: Choose Your Own Path that we tested looked very similar to the one we’ve shown you above. In addition, they’re all just as much of a waste of time as the one we’ve shown you! Therefore, in order to save your time, we’re not going over them all individually. What we can tell you is that none of the hack tools for My Story: Choose Your Own Path really work. We tested them all out and received nothing at all from them. The reason for this is that hacking My Story is impossible. The amount of diamonds and tickets you have on your account is stored in the database on their servers. So if someone wanted to add diamonds and tickets to your account, they’d first have to hack the Nanobit servers. This is next to impossible and explains why none of these hacking sites for My Story do anything. However, what they don’t tell you is how to enter these cheat codes. The reason why they don’t tell you how to enter them is because you can’t enter cheat codes in My Story. These Cheat Codes are nothing more than a random string of numbers and letters that you can’t use for anything. However, it is possible to obtain free tickets and diamonds in a different way. If you’re curious how, make sure to keep on reading and we’ll tell you exactly how. It’s easier than you might expect. After we’ve tested every single My Story Cheats we were quite disappointed that none of them worked. Luckily, there is an alternative method of obtaining diamonds and tickets for free using our method. We discovered this method ourselves and it’s the easiest and fastest way to obtain the resources you’re after completely legitimately. In fact, it’s the only working method anywhere on the internet. To explain how you can use this method properly, we’ve decided to create a guide that’ll teach you step by step exactly what you need to do to obtain the free tickets and diamonds. Our guide works on both the Android and iPhone version of My Story: Choose your own path, so no matter what device you play the game on, you can use it. And best of all, the guide is available to you completely for free. We don’t charge you a single cent to access any of our guides here on TapTapGaming and this one is no exception. Stop wasting your time attempting to use hacking tools for My Story: Choose your Own Path. These unlimited diamond and ticket generators won’t give you anything. Our guide will teach you the most effective method of obtaining them completely for free. Click the big blue button below to access our guide.